John Dorney reports on the Decade of Commemoration Conference held by Queen’s University Belfast at the Royal Hospital Kilmainham, Dublin, in June 2012. Roughly one hundred years ago, a series of dramatic and often violent events changed the course of Irish history. From 1912 to 1914 the Liberal British Government tried to achieve consensus for a Home Rule Bill that would give limited self government to Ireland within the United Kingdom. So far from achieving consensus, this Bill provoked the founding of rival nationalist and unionist militias in Ireland and even a bout of disobedience bordering on mutiny by elements of the British Army over the prospect of being deployed against the Ulster (unionist) Volunteers. This stand off was interrupted by the outbreak of the Great War, in which both mainstream nationalists and unionists pledged their support for the war effort. 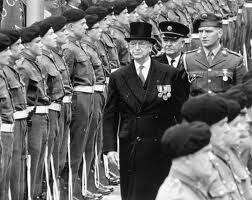 Some 200,000 Irishmen served in the British forces and about 30,000 died. Radical nationalists and republicans, appalled at the scenario of Irishmen apparently enthusiastically fighting for Britain and also in attempt to revive separatist nationalism, launched an insurrection, now known as the Easter Rising, in 1916. The Rising was defeated within a week, but the repression of the rebellion, combined with the threat of conscription for the increasingly unpopular war, did indeed revitalize the cause of Irish republicanism and in 1918 the Sinn Fein party swept aside the moderate Irish Parliamentary Party in the first postwar general election and declared an Irish Republic in January of the following year. From 1919, but especially from mid 1920 until July 1921, a guerrilla war raged between the Irish Republican Army (IRA) and British forces. In late 1921 the warring sides signed a Treaty, formally creating the Irish Free State (26 southern counties) and Northern Ireland(6 of 9 Ulster counties – first created in mid 1920). The two polities in Ireland managed to establish themselves by 1923 after respectively putting down a republican campaign in the north in early 1922 and an intra-nationalist civil war in the south over the Treaty in 1922-23. Political violence in Ireland from 1916-23 claimed about 5,000 lives and injured many thousands more. In Ireland in 2012, it is already becoming slightly draining facing into the prospect of ten years of constant commemorations of all of these events. Each one listed above (and more) are loaded with enormously emotive symbolic value to various sides and as a result, virtually all are highly contested by someone. It is no bad thing therefore, for historians to try to inject some perspective at the start of events and Queens University provided a welcome forum for the airing of diverse views not only of the history but also of the historical memory and of the act of commemoration. Historian Jay Winters, who specializes in the history of commemoration of the First World War, noted that the Irish experience – of war followed by revolution and ethno-nationalist strife – very far from being unique, was the common experience across a great swathe of Europe in the years after 1918. Nor is Ireland unique in trying to unpick historical memory out of a minefield of contested interpretations. Virtually all European societies, Winters argued, must do this when they look back at what Eric Hobsbawm called, ‘The Age of Catastrophe’. We have written before on The Irish Story that the Irish revolutionary period is now passing out of personal memory (even second hand) and into a much less fraught and also much better documented stage, as acres of documentation, long kept under lock and key is being released to the public, very often by the families and descendants of the participants. This is a welcome process which is helping to restore the humanity to those who participated in both world war, revolution and counter-revolution. Winters made this point very powerfully; Historians, he argued do not create or control the past. It is the story of people and therefore in the end, a matter of family, ‘Historians,’ he said, ‘don’t determine public memory’. Why then is public commemoration so important? The American scholar had a good answer for this too. Public history, he argued, especially of epochal events such as war, serves as a ‘cathedral’ for secular societies, ‘where sacred questions are asked and sometimes answered’ – those about the nature of love, life death, comradeship and sacrifice. He has a good point here. The Easter Rising, for instance, holds its great symbolic power not only because it can be said to have founded the Irish state, but from the values the rebels themselves are held to have possessed – bravery, integrity, patriotism and sacrifice. All of which are routinely contrasted with the supposedly corrupt and uninspiring present. For the experience of insurgency and civil war though, commemoration is always necessarily partisan. One cannot equally apportion ‘sacred values’ to those who ‘murdered innocents’ and those who ‘defended democracy’ – labels apportioned according to one’s taste, both in 1912-23 and later in Irish history. For this reason I found myself much more in agreement with Diarmuid Ferriter, the other keynote speaker, who argued against the need for ‘consensus’ to come out of commemoration. Consensus implies a version we can all agree on and such a thing in the end cannot be truly honest. Quoting the novelist Sebastian Barry, Ferriter concluded, that by uncovering historical facts, ‘it is not to accuse, it is simply to assert that it is so’. Before discussing how best to commemorate we should continue to try to discover what actually happened. Very much of this needs to happen if the centenary of the Irish revolution is to mean anything at all beyond a construction of feel-good narratives. Brian Hanley, for instance, made the point that there would be no plans to commemorate the military campaign launched by the National Army against strikers in farms and creameries in 1923. And to this may be added a host of unpalatable happenings, from the North King Street massacre by the British Army in 1916 to the Dunmanway killings by the IRA in Cork in 1922 and ‘pogroms’ of Catholics in Belfast by loyalists to the murder of anti-Treaty prisoners in the civil war. Sebastian Barry’s quote is hard to improve upon. We may or may not damn all sides of that era equally, but we must be prepared to acknowledge sins committed by those with whom we agree as well as those with whom we disagree. One more thing bothered me as I left the conference. Anne Dolan, whose book ‘Commemorating the Irish Civil War’, did excellent work on this very neglected aspect of historical memory, wondered if historians shouldn’t devote as much time to popular understandings of the past as to the nitty gritty of such factual disputes as the Kilmichael ambush of 1920. Why, in others words, people still care about whether or not the 17 Auxiliaries killed there by Tom Barry’s IRA column had first surrendered or not. In one sense, this is a fair point. Popular memory, inevitably shaped by the changing needs of the present, is important. However the one problem I have with this is that it presumes that ‘we’, the historians, already know the history and can judge public memory against the facts. This, especially with regard to the Irish revolutionary period, is not the case. The events of 1912-23 have been much commemorated but very little studied until recent years. It is only now that any study at all is going into events such as the IRA campaign along the border in spring 1922 for instance or the actual course of the Irish civil war. Commemoration may or may not be consensual or pacifist, but, as far as we can still discover the facts, it must be truthful if we are to learn anything from it. Written by: John_Dorney on 19 July, 2012.on 20 November, 2012. 8 Responses to "A Decade of Commemorations"
John, thanks for an excellent report. We regularly work with community groups who have keen local historians amongst their ranks but with the added extra of having direct links with people who took part in many of the events listed above. The network of local historians is very active; connected by smartphone and html. Their phones never stop beeping and they are always ‘doing’. This is my first visit to ye’re website but not my last. Thanks John. Nice to hear from you. The nitty gritty of Kilmichael is defended so tenaciously because of the values the rebels themselves are held to have possessed – “bravery, integrity, patriotism and sacrifice.” To argue the Kilmichael was anything other would be to imply that those values were mythical rather than real. Or is that too simplistic ? No, I think you’re bang on. The thing is though, what if men possessing those qualities were also guilty of killing unarmed men after they had surrendered? I’m not saying this did happen, but would people be prepared to accept it if it did? That’s the real challenge for honesty in commemoration I think. I’ll accept Kilmichael in the context of a necessary evil, if full surrender was offered and not ployed, an eye for an eye. Just as suggested there were wrongs on both sides. I have read Tom Barry’s account and accept it. This short period extends back much further and is the culmination of ‘one’ end and another beginning. As a Corkonian descendant who’s Grandad gained 7 medals, I believe him to be the cream of Ireland, when Cork was a nation with a foe. Excellent summary of Decade of Centenaries – even if you did leave out the Lockout! Like you I found Jay Winters fascinating but unsatisfactory – our heritage industry has to dilute and falsify the past to attract consumers. I can’t help feeling his sales pitch is in part an academic apologia for the new memory lane, or should I say Memory Mall. As for pacificism – I think that as soon as a real conflict of interest arises – such as the Ardoyne last week – the the passive history taker will revert to the ‘real’ thing as he or she understands it to recycle old myths when they become history makers.